Go to Blogger template’s settings section and open permissions. Now as shown below, enter the Gmail address of the person to whom you want to transfer your blog . After inviting , ask your client to verify the confirmation email to accept invitation . 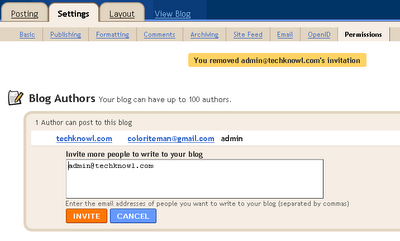 Now, the permission tab in your Blog settings would have changed as shown below . Grand admin privileges to the invited user and remove your account just above that . Now you have successfully completed the transaction of your Blogger blog. Someone asked me to buy my blog where it is a blogger blog. Thanks for this post. It really helps me. By the way, I would ask a favor to you my friend. How much is the price of my blog? 1. No. 7 in the front page of google serps for the keyword term, “blogging advice”. 2. Quality backlinks from other high PR blogs. 3. Google Page Rank of 3. 4. 400+ subscribers (email and rss combined).